Here are some of the steps of making this Tuscan Quilt. 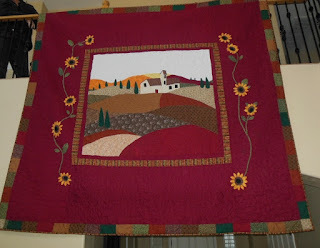 I received a sewing machine last year I have been practicing my free form quilting skills. First I start out with a sketch of an idea, draw it out the actual size. This will serve as my pattern. I had in mind to use reds, oranges, golds in materials. Cutting out sunflower centers, basting into place. Sewing ever petal, ironing preparing to place on quilt. I use to hand turn every piece, but now I sew same material together, turn inside out, cut open and iron for better results. Baste all pieces together to make the sunflower, iron flat. Putting trees in there place. The start of quilting, Starting from the center of the quilt going out. Quilts on parade to see some of my other quilts.